Living Area 4166 + 560 (Poolhous Sq. ft. This charming and beautifully renovated, colonial, brick cape is sited on a sunny well-landscaped property with beautiful in ground pool and pool/party house which has HVAC, plumbing and electric. A quality built home, it boasts renovations and an addition of: step down, high ceiling Family Room with gas fireplace, master bedroom with custom hardwood floors and fabulous custom granite and Italian porcelain tile bathroom; kitchen with quartz counter tops and stainless steel appliances; all bathrooms updated; new Pella Architect Series windows; newer roof; finished basement with powder room and laundry; newer systems--HVAC, alarm, electric and much much more. The rooms are sunny and generously proportioned and most rooms feature custom hardwood floors. This home is terrific for entertaining with its enlarged spaces and for relaxing in its cozy living room. 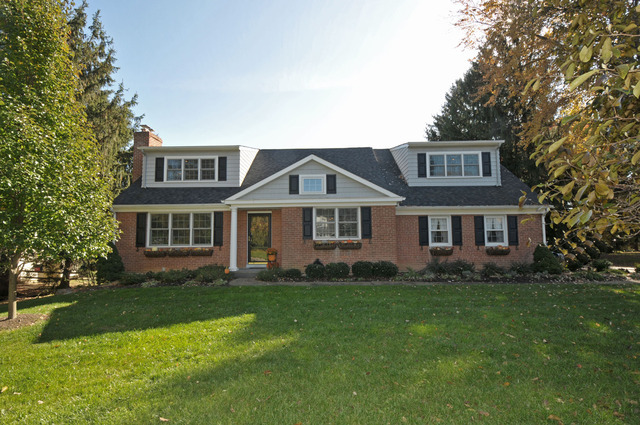 Located in a sought after neighborhood, this home is convenient to all major transportation routes, shopping, and the best public (TE) and private schools in Pennsylvania. It is a must-see. An extraordinary pristine listing, this beautifully renovated Colonial Cape has every amenity--4 family bedrooms--all on 2nd floor/ 5th bedroom possibility on 1st floor--now library/office, new kitchen with quartz counter tops, new custom baths, addition of fabulous 10' ceiling step down Great Room, mud room, large finished basement, wood floors, gorgeous in ground pool with pool/play house for relaxing and entertaining, new systems and much much more. This home is special in every way.